[The War of 1812] inspired a fresh wave of patriotism in a generation too young to remember the Revolution. When [Francis Scott]&nbsp;Key declared that “our flag was still there,” he fused the physical symbol of the nation with universal feelings of patriotism, courage, and resilience. By giving the flag a starring role in one of the most celebrated victories of the war, Francis Scott Key’s song established a new prominence for the flag as an expression of national identity, unity, and pride. - "Symbols of a New Nation", The Star Spangled Banner. Prior to 1814, other American symbols were more prominent than the American flag. Early American gold coins, for example, featured the eagle and the "Liberty Cap." While the Liberty Cap is scarcely recognized today, the American flag has grown in importance. The flag became "the primary symbol of American patriotism" after Francis Scott Key's poetic account of the bombardment of Fort McHenry stirred a powerful sentiment in the American people. Using archival documents and images, students will associate Key's words with historic events and recognize the sentiment those words inspired. In the second part of the unit, students will review the symbols within the flag and look at some historic images of the flag that have become part of our national consciousness. Review each lesson in this unit and select appropriate archival materials to use in class discussions—particularly for Lesson 3. Bookmark them, if possible; download and print out the selected documents and duplicate copies as necessary for student viewing. This unit is divided into two parts, each of which can be used independently. The first section concentrates on the historic origin of the Star-Spangled Banner. The second part concentrates on the flag's symbolism. Throughout the lesson, engage students to think outside the historical context; challenge them to think critically about what the flag and anthem mean to Americans, to our country, and to the rest of the world. The materials list in "The Star-Spangled Banner in Pictures and Words" identifies images that require no (or very little) reading and documents that require reading at varying levels of difficulty. These materials can be assigned to student groups or individuals or simply displayed around the room for everyone to inspect. The extensive list of images and documents allows flexibility in adapting the lesson to a particular class. One group, for example, may be more interested in or comfortable with the documents than another. For "What Does It Mean? ", supply the students with copies of the first stanza (or more, if desired) of the National Anthem. "The Annotated Anthem" is written as a teacher-directed lesson. Independent students can create an annotated anthem on their own. For a whole-class version of Lesson 5, prepare a large copy of the first stanza of the Star-Spangled Banner on a series of sheets of large paper. Select excerpts that will allow for illustration using the documents from "The Star-Spangled Banner in Pictures and Words", or student-created images. Leave sufficient space to illustrate each excerpt with the images the class chooses (or creates). For "Symbols in a Symbol: What Does the Flag Mean? A Mini-Lesson", obtain a large flag to share with the class and/or individual flags for each student. Check with your local VFW Post. For "What Does the Flag Mean? ", prepare copies of the poem to distribute as necessary. In addition, students who will give the survey at home will need copies of the images. Reducing the size of the images and placing them on one sheet would save paper. The Digital Classroom, available through EDSITEment, offers a series of worksheets for analyzing primary source documents, including written documents and photographs, that you may wish to use or adapt to help students in reviewing the materials presented in this unit. A few days before you begin the unit, challenge the students to look for the American flag everywhere. Tell them the class will be compiling a list of all of their flag sightings. Their sightings can include actual flags, images of flags and references to the flag. Compile the class list of flag sightings. Follow with a discussion about the flag. Pose the following sorts of questions to the students: Why is the flag important in the military? Why did an American astronaut leave an American flag on the moon? Why do American athletes cry when they see the flag and hear the National Anthem played during the Olympics? Did anyone see any use of the flag he/she felt was inappropriate? And finally, why does the American flag symbolize pride for the United States? The Star-Spangled Banner was made by Mary Pickersgill for Fort McHenry. It originally measured 30 x 42 feet, about one-quarter the size of a basketball court, but a large portion of the flag is now missing. Each star is about two feet across. This flag design became the official United States flag on May 1, 1795. With the addition of two stars for Vermont (admitted as the 14th state on March 4, 1791) and Kentucky (admitted as the 15th state on June 1, 1792), this flag was to last for 23 years. The five Presidents who served under this flag were George Washington (1789-1797), John Adams (1797-1801), Thomas Jefferson (1801-1809), James Madison (1809-1817) and James Monroe (1817-1825). The 15-star, 15-stripe flag was authorized by the Flag Act of January 13, 1794, adding two stripes and two stars. The regulation went into effect on May 1, 1795. This flag was the only American flag to have more than 13 stripes. It was immortalized by Francis Scott Key during the bombardment of Fort McHenry, Sept 13, 1814 (see The 15-Star Flag, on The Flag of the United States of America, a link from the EDSITEment resource Internet Public Library). The Star-Spangled Banner was likely damaged not only in the Battle of Baltimore but also by time, the actions of its owners and previous attempts to restore it. Have students look at a recent photograph of the American flag from Fort McHenry, which inspired "The Star-Spangled Banner" and is now on display at the Smithsonian Institution, available online via a link from the EDSITEment-reviewed website Internet Public Library. Why are so many people looking at the flag in the photograph? What do students notice about the condition of the flag? How many stars were there all together? What could have happened to the damaged star? What in the classroom can help us visualize the size of the stars in this flag, which are two feet across? How big does that make the whole flag? Why would a flag meant to fly at a fort be made so large? What may have caused the present condition of the flag? How can you tell? Look at The Star-Spangled Banner, a 1913 portrait of Francis Scott Key reaching out toward the flag, available on the EDSITEment resource America's Library. This is the same flag as in the first photo. What's going on in the painting? Identify the flag for the class as the Star-Spangled Banner. "The Star-Spangled Banner in Pictures and Words" will help students answer many of the questions posed in this lesson. Recite the first stanza of the National Anthem for the class. 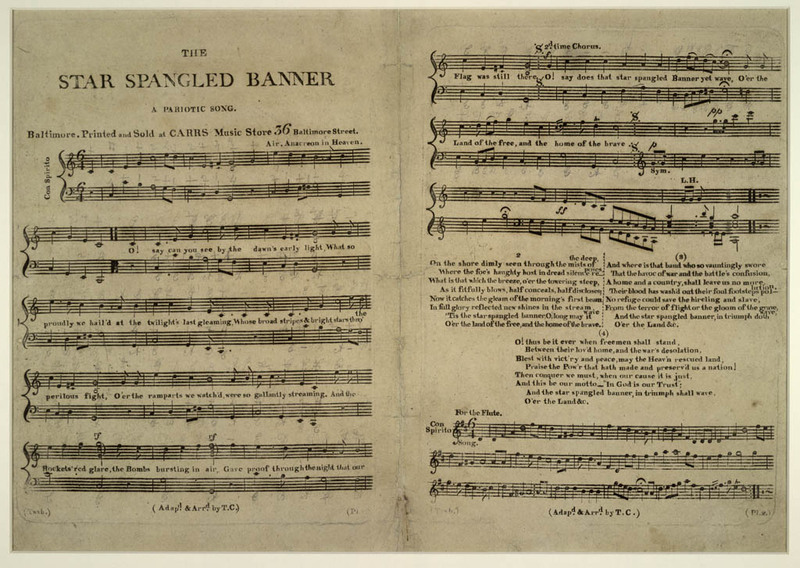 Tell students they will understand the difficult words better and learn more about the early history of the Star-Spangled Banner (flag and song) by analyzing some primary source materials. What happened on Tuesday, Sept. 13, and Wednesday, Sept. 14, 1814? What in the first verse of the National Anthem refers to something that actually happened? Which objects show how the poem "The Defense of Fort McHenry" by Francis Scott Key was being publicized? Which objects indicate that Francis Scott Key's poem was popular? Why do you think the poem was so popular? Did the song immediately become our National Anthem? What caused the present condition of the flag known as the Star-Spangled Banner? What indication is there that the bombardment of Fort McHenry and the subsequent events surrounding Key's poem are considered important today? Make available to the class the images and documents you have selected from the list of EDSITEment resources below. Include the captions with the image or document. These materials could be displayed for the whole class or particular images or documents can be assigned to student groups or individuals. First printed edition combining words and music (Baltimore: Thomas Carr, 1814 Printed sheet music), available on the Library of Congress website, a link from American Memory. One of only ten copies known to exist, this copy of "The Star-Spangled Banner" is housed today in the Library of Congress. 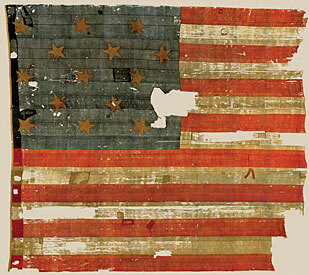 Fragment of the Fort McHenry flag, available on The Star-Spangled Banner, a link from Internet Public Library. Certain people were granted the privilege of cutting fragments from the flag as souvenirs. "Indeed had we have given all we had been importuned for," Georgiana Appleton wrote, "little would be left to show." Owners of some of these historic fragments have given theirs to the Smithsonian. Images of Red Chevron, available on The Star-Spangled Banner, a link from Internet Public Library. Louisa Armistead sewed the red chevron on one of the flag's white stripes. According to her daughter, she intended it to be the letter A, probably for "Armistead." Francis Scott Key. "The Star-Spangled Banner." Washington, D.C., October 21, 1840. Holograph manuscript. Music Division, Library of Congress (65), available on the Library of Congress website, a link from American Memory. Francis Scott Key (1779-1843) witnessed the British bombardment of Fort McHenry in Baltimore Harbor on the night of September 13 and 14, 1814. Exhilarated by the successful defense of the fort, Key wrote the words that became in 1931 the National Anthem of the United States. Key wrote the poem in 1814; rewriting it by hand in 1840 indicates the ongoing popularity of the piece. The National Anthem was officially adopted in 1931. Before that time, others had attempted the writing of a National Anthem. An example from 1879 is available via a link from American Memory; an 1883 anthem, America: A National Anthem, is available on American Memory. Official Account of the Bombardment of Fort McHenry, available on The Star-Spangled Banner. Francis Scott Key's Original Manuscript, available on The Star-Spangled Banner Complete version (transcript) of "The Star-Spangled Banner" showing spelling and punctuation from Francis Scott Key's manuscript in the Maryland Historical Society collection. An audio clip of the Star Spangled Banner is available on this site. After reviewing the images and documents, discuss student reactions as a class. Allow students to share their hypotheses regarding the questions presented at the beginning of the lesson and to identify specific documentary evidence to support their theories. Recite the words of the first stanza of the National Anthem with the class. Go through the stanza phrase by phrase. What does the class understand each to mean, or refer to, now? 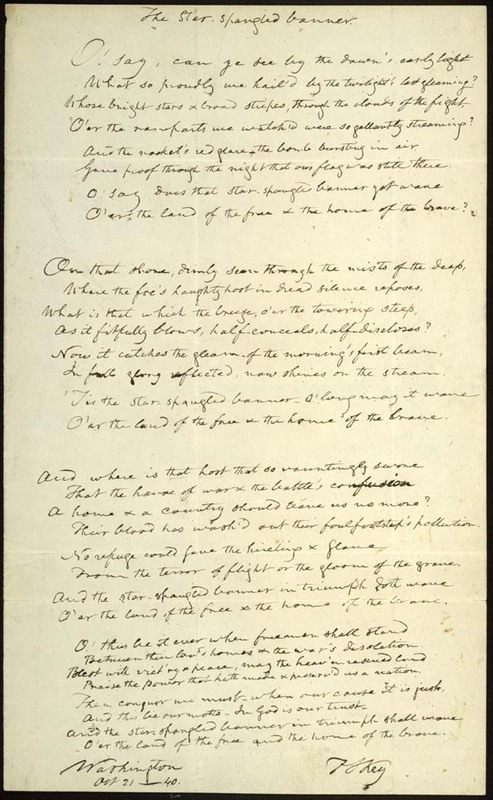 As a culminating activity, challenge the class, under your guidance, to use materials from Lesson 3 to create an annotated copy of the first stanza of "The Star-Spangled Banner." On large pieces of paper, display appropriate sections of the first-stanza lyrics. Ask students to select an image or document, or to design an image to illustrate the words on each page. Attach the appropriate image or document to each excerpt. Put a brief explanation (as suggested by students) at the bottom of each page. Technically savvy students could turn this product into a slide presentation using PowerPoint or HyperCard. Activity 2. What Does the Flag Mean? A symbol stands for an idea. Over the years, a symbol tends to take on a meaning related to its history, function or appearance. Ideas can also be gradually transferred to an object over time. In this way, an object can take on new meanings. For example, when you see the Star-Spangled Banner, you may simply see a large flag, you might think about its history, or you may have personal feelings about the flag based on your own experiences. Over the course of our country's history, the flag has become more important as a symbol of our country, though each American can still endow it with a personal meaning. Why were those designs and colors chosen? To answer this question, share with the class Symbols of U.S. Government: The American Flag, a brief essay on Ben's Guide to Government for Kids, a link from the EDSITEment resource Internet Public Library. Lesson 7 What Does the Flag Mean? Share the following poem with the class. Consider reading it to the class during your usual story time. (Note: It is not necessary to identify all of the historical events mentioned in the poem, or to identify what is factually correct or incorrect in it, to discuss the author's intention. Though composed by a famous songwriter — Johnny Cash — this piece was written as a poem and is not available as a song.) This poem is also available from EDSITEment in .pdf format. You may wish to download the poem and make copies. He said, "Have a seat," and I sat down. But we're kinda proud of that Ragged Old Flag. Sat watching it writing Oh, Say Can You See. With Packingham and Jackson tuggin' at its seams. She's been burned, dishonored, denied and refused. "Ragged Old Flag" written by Johnny Cash, © 1974 (renewed) SONG OF CASH, INC. (ASCAP) / Administered by BUG MUSIC / All rights reserved. Used by Permission. Discuss the poem. What made the old man in the poem proud of the flag? According to the old man, where had the flag been? Do you think he was talking about the flag in front of the courthouse or the American flag itself? What would you say the flag meant to the old man? The flag is important to Americans. For example, think about medal-winning athletes who break into tears when they see the flag. People associate the flag with our country's ideals and its history. In this lesson, students decide what the flag means to them. Share with the class an appropriate number of the following images and their captions from EDSITEment resources. For each, ask students to write one sentence describing what the picture brings to mind about the American flag and the United States. They should react to each image you present, even if they are unfamiliar with the historical moment portrayed. The flag as a symbol of our country's history. The flag as a symbol of the fight for freedom around the world. The flag as a symbol of American heroes who died in service to our country. The flag as a symbol of our country's technological achievements. The flag as a symbol of individual achievement by American heroes. Discuss the images and the students' reactions. Which images stirred the students the most? What does the flag mean to the students? A Survey: What Does the Flag Mean to Americans? Now that the class has reacted to various images of the flag, students will attempt to determine if older Americans react in a similar way. What does the flag mean to their parents and/or other significant adults in their lives? During class discussion, have students prepare a few questions for a survey they will present to various adults, and decide which images to use (one or more of those from "Symbols in a Symbol: What Does the Flag Mean? (above)," or others that you or the students select). When the questions are ready, have students complete the survey with an assigned number of adults; provide a deadline when surveys should be completed. After students have had a chance to give the survey, discuss the results. What are the similarities between adult and student reactions to the images? Differences? Is it possible to sharpen the definition of what the flag means to Americans in general or were reactions mostly individual? Old, Wendie C. George Washington. Springfield, N.J.: Enslow Publishers, 1997. Read A New Flag Flew Over the U.S. Capitol on the EDSITEment resource America's Library. There has been discussion of Puerto Rico or Washington, D.C., becoming a 51st state. How would students propose to arrange 51 (or 52) stars? The designer of the 50-star flag has already designed a 51-star flag. For the story behind both designs, visit Robert G. Heft: Designer of America's Current National Flag, available on The Flag of the United States of America, a link from the EDSITEment-reviewed website Internet Public Library. 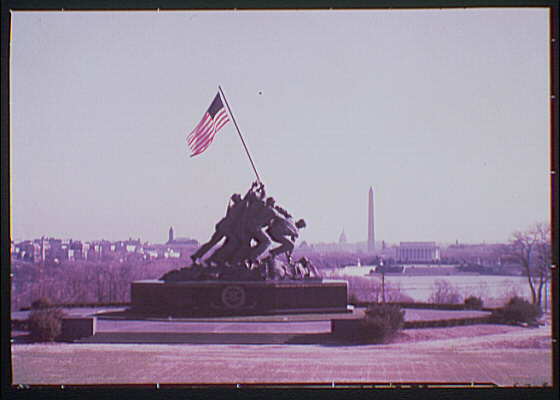 Students interested in the controversy over the condition of the flag can try the interactive activity You Solve the Mystery on The Star-Spangled Banner, a link from the EDSITEment resource Internet Public Library. For further information, read The Star-Spangled Banner Preservation Project or Facts and Details about the Preservation Project, both available on The Star-Spangled Banner. Did Betsy Ross really create the first flag? Though many scholars believe she did not, others believe she did. Information on both sides of the controversy may be found on Betsy Ross and the Betsy Ross Homepage, both available via links from the EDSITEment-reviewed website Internet Public Library. Interested students can learn more about the Battle of Baltimore and the War of 1812. Through the website Fort McHenry, a link from the EDSITEment-reviewed website Internet Public Library, students can research further key people or places associated with the Star-Spangled Banner, such as Francis Scott Key, General Armistead and Fort McHenry. 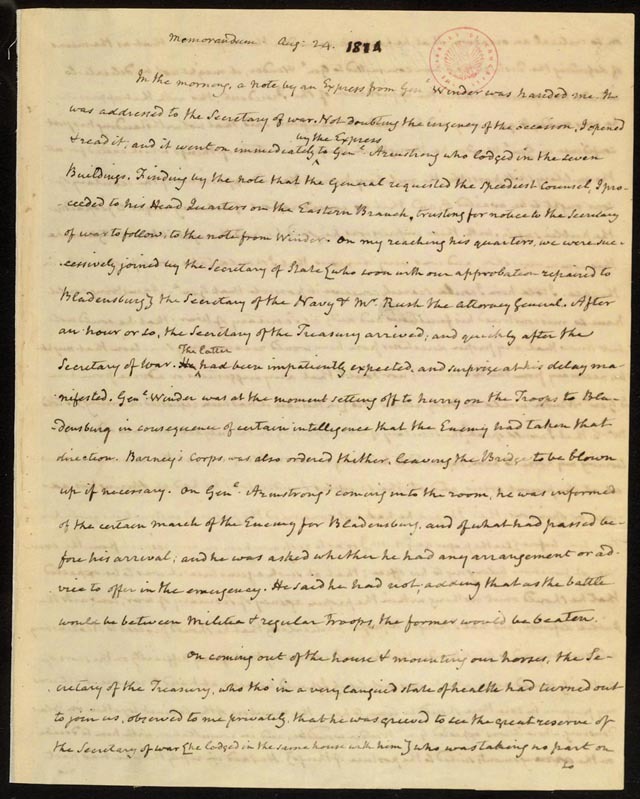 A memorandum in which President Madison describes his futile attempt to organize a military defense of the nation's capital on August 24, 1814 is available on the Library of Congress website, a link from the EDSITEment resource American Memory. Every state has its own symbols, such as flags, mottoes and songs. A good place to start an investigation of state symbols is 50 States & Capitals, a link from the EDSITEment-reviewed website Internet Public Library. It also contains a link to every official state website (click on the state name at the top of each state's page). The Star-Spangled Banner has four verses. Generally, only the first is sung. Students who want to become familiar with the entire song can find the lyrics on Songs and Oaths: The Star-Spangled Banner, available on Ben's Guide to U.S. Government for Kids, a link from the EDSITEment resource Internet Public Library. Your local VFW Post may have a program to bring to your classroom about the history and/or etiquette of the flag. In what ways do the lyrics of "The Star-Spangled Banner" reflect actual events? What evidence do we have of its popularity? What are some events involving the flag that have contributed to Americans' image of their flag and their country?